This coastal city of 90,000 persons is known for its fishery products and nearby hot springs. It lies north of the 38th parallel, but it is part of South Korea. 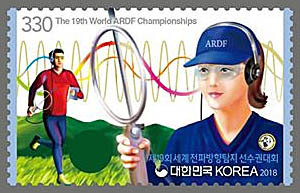 In September, it was host city for the 19th World Championships of Amateur Radio Direction Finding (ARDF). If you replied, "What is Sokcho, Alex?" then you might be a Jeopardy champion. Every even-numbered year, fans of on-foot hidden transmitter hunting gather to see which individuals and nations are the best at this growing radiosport. The host country is chosen by a committee of the International Amateur Radio Union (IARU). Competitors represent their national Amateur Radio Societies, such as ARRL, RAC and RSGB. The first ARDF World Championships were in Poland in 1980 and for twenty years, it was almost exclusively a European event. This year marks the third time that it has been in IARU Region 3 (Asia and Oceania) and the second time that it has been in South Korea. USA began participating in 1998 and has earned at least one medal in every World Championships since 2006. Each participating country is permitted send up to three competitors in each of eleven age categories, six for males and five for females, in accordance with IARU rules. 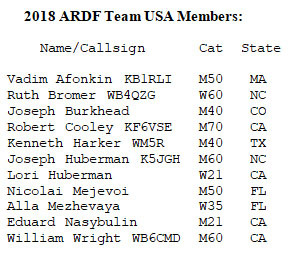 As ARRL's ARDF Coordinator, I issued invitations to thirty persons to compete for USA, based on their finishes in the Eighteenth USA ARDF Championships (California, June 2018) and the Seventeenth USA and Ninth IARU Region 2 ARDF Championships (Ohio, August 2017). Because of health issues, economic considerations and activity conflicts, only eleven were able to accept. This year's team had eight male competitors and three female competitors, ranging in age from 35 to 76. Team members were responsible for all of their own fees, lodging and transportation expenses. For 2018, KARL chose competition sites near Sokcho in Gangwon Province. It is in the northeast corner of South Korea, along the coast. The accommodations were excellent, the nearby mountains were beautiful, and the weather was mostly dry and pleasant. Over 300 competitors gathered from 29 nations. The largest category was M50 (men ages 50 through 59), with 44 entrants. Each national team must have a Captain, whose duties are very important. They include working with the organizers to resolve the team's issues of in-country housing, transportation and fees with the organizers. Each day of competition, the Captain is responsible for making sure all team members get on the bus on time with all of their equipment, and then are at the starting line at their scheduled times. He or she handles all team matters with the international jury, including any protests. This year's Captain was Ken Harker, WM5R, who has won medals at the USA ARDF Championships numerous times. He and his wife Jennifer, W5JEN organized the USA ARDF Championships in 2008 and 2016. This was Ken's fourth trip to the ARDF World Championships. Participants and visitors arrived in Sokcho on Sunday, September 2. The next day featured short practice courses for warm-up and equipment testing. Then it was time for the the formal opening ceremonies, which featured local entertainment. On Tuesday, everyone was transported by coach to a big park near a school for the foxoring event. Foxoring is a hybrid of orienteering and RDF in which competitors receive a map marked with small circles. They use map and compass to make their way to the location represented by each circle and then use RDF gear to find the transmitter somewhere therein. The foxes run very low power with short antennas on eighty meters, so they usually cannot be heard outside their circles. As always in ARDF, scoring is first by number of required foxes found and second by elapsed start-to-finish time. The KARL organizers made the extra effort to produce separate maps for each category that showed only the required fox circles. A total of ten transmitters were in the park, plus the finish beacon, but the number of required foxes per category ranged from four to eight. Bill Wright, WB6CMD says that this foxoring course was a bit easier than the one at the 2018 USA ARDF Championships in June. "The foxes were close to the trails and there was essentially no off-trail navigation needed, which was good because there was a great deal of undergrowth. It was a very steep course with a lot of stairs, sometimes 100 stair steps at a time. Because of that and the fact that the trails were wet from recent rain, it was not very runnable." 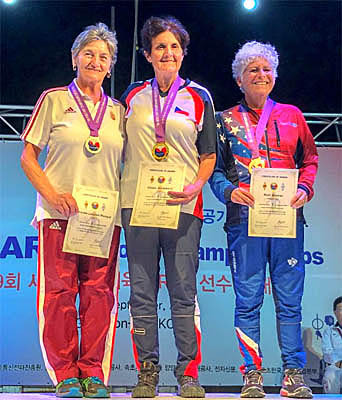 The foxoring brought Team USA its first medal of this year as Ruth Bromer, WB4QZG captured individual third place in the W60 category. Like the Olympics, the World ARDF Championship medal presentation ceremonies are formal get-togethers with elevated platforms, stirring background music and playing of the national anthems of the gold medalists. Also doing well in this event were Vadim Afonkin, KB1RLI; Bob Cooley, KF6VSE and Ken Harker, WM5R, who had top-ten finishes in their respective categories. On Wednesday was the first classic ARDF event with two full five-fox courses, one on two-meter AM and the other on eighty-meter CW. Groups of competitors in different categories started at five minute intervals, some for one band and the rest for the other band. They sought the required transmitters for their category and then rushed to the finish, which was in a different location from the start. In the classic events, there are medals for the first three individuals in each category. There are also national team awards in each category, based on the aggregate scores of the two or three individual team members. The team members are not permitted to assist one another on the courses. In ARDF, the required foxes may be found in any order. There is a continuous transmitter on a separate frequency near the finish to help those who get lost, lose their map or break their glasses. Measured point-to-point from start to each fox and then to the finish by the shortest route, the courses for various categories ranged from 4.7 to 6.7 kilometers. But of course it wasn't possible to run point-to-point much of the time. "This was the most difficult course of the four," says WB6CMD, who was among the two-meter hunters. "There were thick bushes, trees and vines everywhere, so it was very slow and you had to choose your route carefully. There were several roads going east and west, but going north and south was very difficult unless you went on a very small trail and had to knock through some jungle, the dark green on the map. "I didn't have problems with the signals," Bill continues. "I don't think I was getting strong reflections. My bearings seemed to be OK and gave me a good idea of where the transmitters were. But even medium green on the map was difficult to hack through. It was something you don't see much in the states, at least not in California. If you didn't pay attention to the map, you could find yourself on a trail that just faded out or ended." This site was so difficult that numerous competitors went over the 140-minute time limit and a few didn't find any transmitters. But five Team USA members were medalists that day. Finishing third out of thirteen M50 teams on two meters were our three M50 competitors: Vadim Afonkin KB1RLI, Nicolai Mejevoi, and Bill Wright WB6CMD. 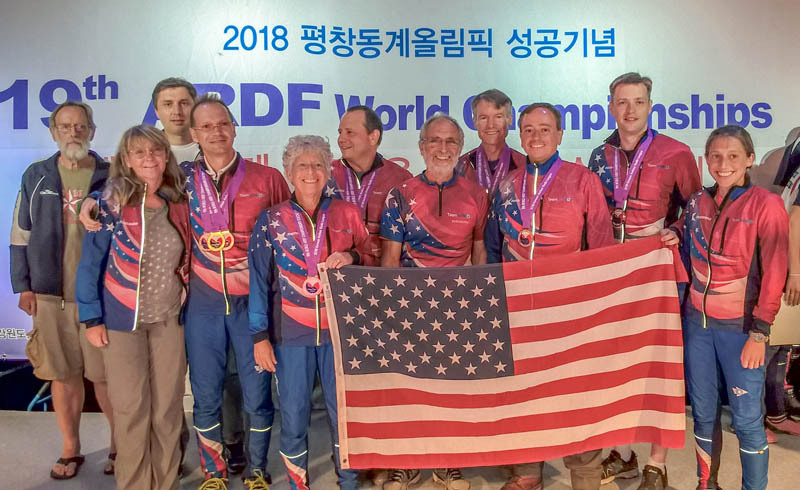 Also on this day, the M40 category team of Ken Harker WM5R and Joe Burkhead won bronze on 80 meters, ahead of nine other teams. In addition, Bob Cooley finished fourth in M70 category on two meters and Lori Huberman was seventh in W21 category on eighty meters. Everyone was back on the buses Thursday morning for the sprint, which is an 80-meter event with two five-fox short courses, a slow CW set and a fast CW set. Each course is on a different frequency with twelve-second transmissions to give a complete cycle every minute. WB6CMD enjoyed this event, even though the antenna of one transmitter was down on the ground for about twenty minutes. "The site was close to the beach," Bill says. "This was the nicest venue, mostly flat, runnable forest. There was a sloppy area in the middle of the slow CW transmitters and an uncrossable fence separating the fast CW transmitters, but overall I was quite pleased with it." Almost everyone had a very fast run in the sprint. Point-to-point course lengths were approximately two kilometers and the time limit was one hour. There were no medals for our team this day, but Ruth Bromer, WB4QZG had a sixth-place finish. The sprints finished in time for the traditional "cultural excursion" in the afternoon. According to WB6CMD, "We were taken for a tour of the Demilitarized Zone, which was quite surreal but well worth the time. The village formerly known as Panmunjom, where the 1953 armistice was signed, is now called the Joint Security Area. We got to see exhibits, the train station and some North Korean incursion tunnels." On Friday was the final competition, another classic round in which each competitor went foxhunting on the band that they didn't hunt on Wednesday. Everyone agreed that this site was much easier to navigate than Wednesday's classic site, with much less dark green on the map. Course lengths were slightly longer, ranging from 4.4 to 7.1 kilometers, but almost everyone did better. Only a few exceeded the time limit and all Team USA members except one found all required transmitters. 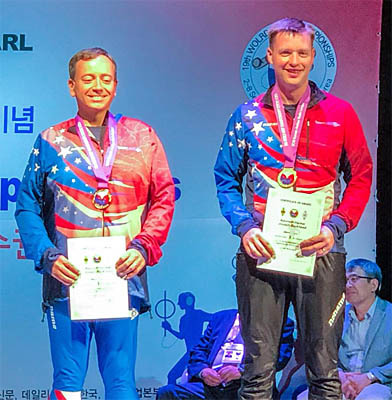 During the award ceremony, the Star Spangled Banner was played on the loudspeakers and was proudly sung by all of the Team USA members as Vadim Afonkin, KB1RLI accepted a gold medal. He completed the 80 meter course in just under 51 minutes to capture individual first place on in M50 category, ahead of forty others. Vadim was soon back on the podium with his M50 teammates Nicolai Mejevoi and Bill Wright as they took bronze in the team standings for the second time. Also on this day, Bob Cooley, KF6VSE took fourth place in the M70 category on eighty meters with an excellent 67-minute run. When it was all over, Captain Ken Harker was ecstatic. He wrote, "Team USA had its best performance ever! We took home more medals than in any previous championships: eight team medals and two individual medals, including our first gold medal since 2012. 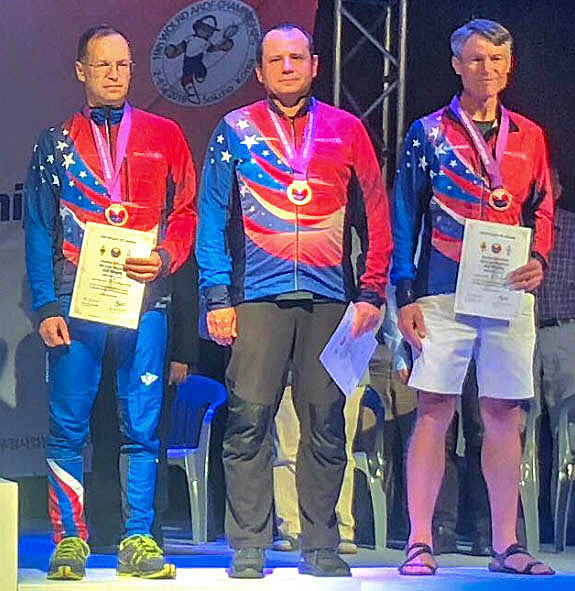 Over half of the team members took home at least one medal and Vadim Afonkin, KB1RLI won three medals total, the most any USA radio-athlete has earned at a single ARDF World Championships." First-time team member and future ham Joe Burkhead of Parker, Colorado was quick to express his excitement about taking part. wrote, "Congratulations and thanks to the whole team for such a tremendous experience. It was a great honor to represent USA at a World Championship, to be a part of such an amazing and fun team, to see everyone do so well and be so competitive, and as Vadim noted, to exceed our own expectations. As a relative rookie in this sport, I'm especially grateful to all of you who have shared so many tips and so much good advice. I look forward to building on our successes in the coming months and years." Two pages of photos of Team USA's activities in Korea are now in this Homing In site. The Korean organizers' official Web site is http://www.ardf2018.kr. Complete results of the 2018 World Championships are posted at the Deutscher Amateur-Radio Club Web site. You can also follow ARDF Team USA on Facebook. Portions of this report have been excerpted from my Homing In column in the November 2018 issue of CQ Amateur Radio Magazine. Text and photos copyright © 2018 Joseph D. Moell. All rights reserved.